Lycium is a genus of flowering plants in the nightshade family, Solanaceae. The genus has a disjunct distribution around the globe, with species occurring on most continents in temperate and subtropical regions. South America has the most species, followed by North America and southern Africa. There are several scattered across Europe and Asia, and one is native to Australia. Common names English names for plants of this genus include box-thorn and desert-thorn. The plants are also called אטד (ațad) in Hebrew and عَوْسَج (eawsaj) in Arabic. There are about 70 to 80 species. The most important are Lycium barbarum and Lycium chinense, whose fruits (wolfberries or goji berries) are an important traditional food crop in China and have recently become a popular health food all over the world. The generic name Lycium is derived from the Greek word λυκιον (lykion), which was applied by Pliny the Elder (23-79) and Pedanius Dioscorides (ca. 40-90) to a plant known as dyer's buckthorn. It was probably a Rhamnus species and was named for Lycia (Λυκία), the ancient southern Anatolian region in which it grew. The berry is called lycii fructus ("lycium fruit") in old Latin pharmacological texts. Lycium are shrubs, often thorny, growing 1 to 4 meters tall. The leaves are small, narrow, and fleshy, and are alternately arranged, sometimes in fascicles. Flowers are solitary or borne in clusters. The funnel-shaped or bell-shaped corolla is white, green, or purple in color. The fruit is a two-chambered, usually fleshy and juicy berry which can be red, orange, yellow, or black. It may have few seeds or many. 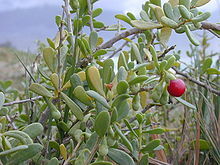 Most Lycium have fleshy, red berries with over 10 seeds, but a few American taxa have hard fruits with two seeds. While most Lycium are monoecious, producing bisexual flowers with functional male and female parts, some species are gynodioecious, with some individuals bearing bisexual flowers and some producing functionally female flowers. 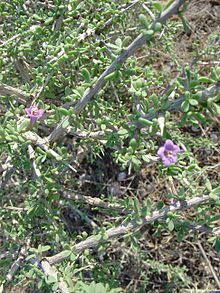 Lycium has been known to European herbalists since ancient times, and species were traded from the Far East to Europe by the Romans, for example via Ariaca and the port of Barbarikon near today's Karachi, as mentioned in the Periplus of the Erythraean Sea. In his Naturalis historia, Pliny the Elder describes boxthorn as a medicinal plant recommended as a treatment for sore eyes and inflammation, as does Pedanius Dioscorides in his P. Dioscoridae pharmacorum simplicium reique medicae. In his 1753 publication Species Plantarum, Linnaeus describes three Lycium species: L. afrum, L. barbarum, and L. europaeum. Lycium, particularly L. barbarum, have long been used in traditional Chinese medicine. The leaves and roots of other species of Lycium, such as L. europaeum, when mixed with water, have been used in folk medicines to treat skin rashes and in promoting hair growth. The fruit of L. barbatum and L. chinense, known as goji berry, is commonly consumed as a dried fruit. The Chinese tonic gou qi zi ("wolfberry fruit") is made of the fruit of any of several Lycium species, and is used as a dietary supplement, although there is no evidence that it has any biological effects. Lycium species mostly occur in arid and semi-arid climates, and a few are known from coastal zones in somewhat saline habitat types. Invasive species include L. ferocissimum, which was introduced to Australia and New Zealand and has become a dense, thorny pest plant there. It injures livestock, harbors pest mammals and insects, and displaces native species. ^ "Genus Lycium". Taxonomy. UniProt. Retrieved 2009-04-16. ^ a b "Genus: Lycium L." Germplasm Resources Information Network. United States Department of Agriculture. 2009-09-01. Retrieved 2010-12-13. ^ a b c Fukuda, T., et al. (2001). Phylogeny and biogeography of the genus Lycium (Solanaceae): Inferences from chloroplast DNA sequences. Archived 2003-11-30 at the Wayback Machine Molecular Phylogenetics and Evolution 19(2), 246-58. ^ a b Lycium. The Jepson eFlora 2013. ^ Lycium. Integrated Taxonomic Information System (ITIS). ^ a b Lycium. Flora of China. ^ a b Levin, R. A. and J. S. Miller. (2005). Relationships within tribe Lycieae (Solanaceae): paraphyly of Lycium and multiple origins of gender dimorphism. American Journal of Botany 92(12), 2044-53. ^ Miller, J. S. and D. L. Venable. (2002). The transition to gender dimorphism on an evolutionary background of self-incompatibility: an example from Lycium (Solanaceae). American Journal of Botany 89(12), 1907-15. ^ a b Hitchcock, C. L. (1932). A monographic study of the genus Lycium of the Western Hemisphere. Annals of the Missouri Botanical Garden 19(2/3), 179-348 and 350-66. doi:10.2307/2394155 (First page image). ^ a b c Gross PM (2007). "Goji: what it is... and isn't". NewHope Network, Penton Media Inc.
^ "Goji Berries" (PDF). UK Food Standards Agency, Novel Foods, Additives and Supplements Division. June 2007. Archived from the original (PDF) on 20 November 2012. Retrieved 13 April 2013. ^ Lycium ferocissimum (African boxthorn). Invasive Species Compendium. CABI. ^ a b "GRIN Species Records of Lycium". Germplasm Resources Information Network. United States Department of Agriculture. Archived from the original on 2008-10-05. Retrieved 2010-12-13. ^ "Lycium". Integrated Taxonomic Information System. Retrieved 2010-12-13. Wikimedia Commons has media related to Lycium. This page was last edited on 31 October 2018, at 15:23 (UTC).